Panache Partners and Signature Publishing Group have rejuvenated the print and publishing industries. And they’ve done it organically, by creating a product that pools creative talent and practically markets itself among affluent, on-the-verve communities. They’ve even created jobs in printing and publishing that allow the industries to experience growth. In 2002, Brian Carabet and John Shand pooled together their 25 years of experience and created the now internationally acclaimed Design by City series, Spectacular Homes series and Perspective on Design series, along with a host of other coffee-table book series stretching from North America to Canada to London. Panache even custom-designs look-books to fit clientele tastes and needs. 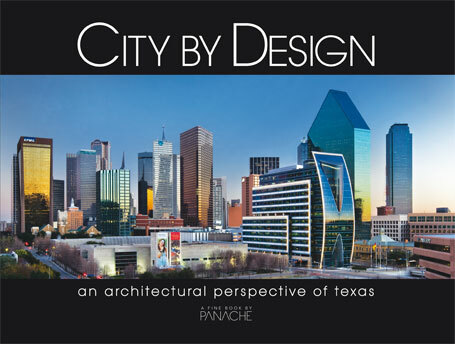 Brian Carabet and John Shand created the City by Design Series in 2002. The books are published by sister company Signature Publishing and distributed by Independent Publishers Group, which was the first to market titles solely from independent presses to the book trade. Since 1987, IPG has operated under the Chicago Review Press and has enjoyed many successes with clients spanning the globe. For all their efforts, Panache Partners are experiencing great success and growth. Even better, the company is headquartered in Plano, Texas, a bustling Dallas suburb that is affluent with an elevated cost of living and operations. In Plano, Panache finds a great audience to whom they can market and almost assuredly experience success. But the thing that sets Panache apart from others is their product. Panache creates the most visually-appealing, creativity-inspiring, luxurious-feeling coffee-table books. They practically open themselves up to a wide audience, from the architect looking for samples of what a particular region might find warm and inviting, to the orthodontist looking for an interesting book to keep her waiting patients occupied. It is the product–hundreds of high-detail, oversized photos on slick, high-quality paper–that markets better than any agency ever could. By organically engaging the senses with a well-made product, Panache created the look-book that doesn’t need a commercial or a billboard to sell it. A product that can sell itself liberates a company from too much of a dependence on marketing and advertising. With more than 40 titles of coffee-table books, Panache can focus its money on Research and Development, pumping more of their resources into travel and photography, writing and editing, print production and finishing–creating jobs in the writing, printing and publishing industries that are in direct competition with their online counterparts. And when the book is done, every description wittily and stylishly written, every photo oversized and in eye-popping detail, every spine, cover and page offering that visceral texture, scent and aura of a high-quality, well-made item–the coffee-table books put traditional marketing to shame and sell themselves, by referral only. From a small town in Vermont, where the sun rarely shines in winter, a determined twenty-four year old girl works at producing a unique and hand-made clothing collection. Nicole Erin Carey of Wolcott, Vermont, moved from Philadelphia and carried her talent along with her. Inside her apartment, where she lives with her boyfriend and two dogs, Nicole works endlessly at producing a vivid collection with an array of colors and textures. Using her everyday life as inspiration for her designs, Nicole strives to make Nicole’s Threads comfortable and easy to wear. “I design mostly with my own ideals for what I like wearing,” she says. Nicole’s clothing screams vagabond chic. Her articles vary from cow neck sweaters to long plaid skirts and vibrant legwarmers. It is clear that Nicole works tediously and patiently as most of her clothing has some form of intricate mélange that can only be achieved by her obvious dedication. Each of Nicole’s pieces is mostly one of a kind. With this mindset, Nicole ensures the individuality of her designs by using a variety of accents and combinations. 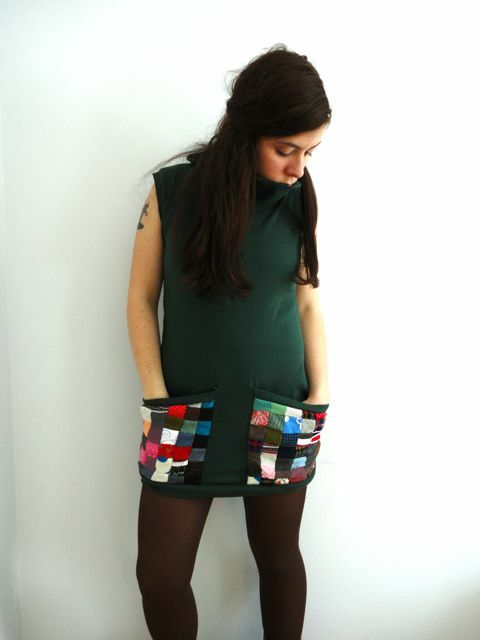 Without a set method to her design process, Nicole’s fabric carries her inspiration. Instead of sketching or mapping out an idea, Nicole lets the fabric and colors encourage her and follows in the direction they lead. Nicole’s creativity is not limited to her line of clothing. Not unlike the construction of her clothes is Nicole’s rustic jewelry some of which consists of scrap fabric and others are made with ceramic material. Her wide varieties of antiquarian button earrings add a finishing touch to her garments. Nicole sits in high spirits as a part of something she feels is continuing to grow. With hopes for her business on Etsy, Nicole’s is sure to continue to thrive. “It’s a happy community that is very self-sustaining and supportive of one another,” she says. Looking forward to the production of her next line, Nicole will design using mostly organic, hand-dyed cotton material. “It’s coming soon, look out!” she warns. Nicole’s customers are very satisfied with her fast delivery, comfortable items, and cute packaging. With an Etsy shop featuring more than 70 articles of clothing, 62 pairs of earrings, and 50 plus accessories, there is sure to be something for everyone. Make your outdoor pool an indoor as well! Live somewhere sunny enough for a pool, but windy enough for falling leaves? Hate having to put a tarp cover on? Want to lay by, or in, your pool even when it’s raining? If you answered yes to any of the following questions then you are in need of a Telescopic Pool. Designed by Inter Pool Cover Team, this design helps cover (pun intended) all-of-the-above. 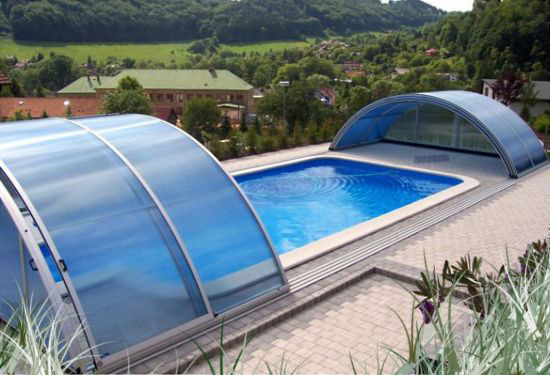 This transparent, telescopic enclosure gives you the privacy you crave while adding a bit of style to your outdoor pool. It is especially useful if you live in great, but rainy, places like the Northwest and refuse to let mother nature keep you from your dream pool. When it does give you those few weeks of sunshine, just open and enjoy! Yet even when closed, you will still have the beautiful view you do when opened. You don’t even have to worry about the air flow once closed. Plus, the Telescopic Pool has an Air Fresh system that generates active ventilation. Prices vary depending on the size and if you need one custom built. You can chose from their low enclosure, standard enclosure, half enclosure or bespoke enclosure design. Just email or call with your plans and ideas by finding them at the Telescopic Pool Enclosure website. Earning a spot in the 2010 Top Ten Green Project is a great honor. One of the designs honored was The Watsonville Area Water Resources Center in Watsonville, California. This exceptionally designed piece of architecture has caught the eye of anyone and everyone who has visited the center. 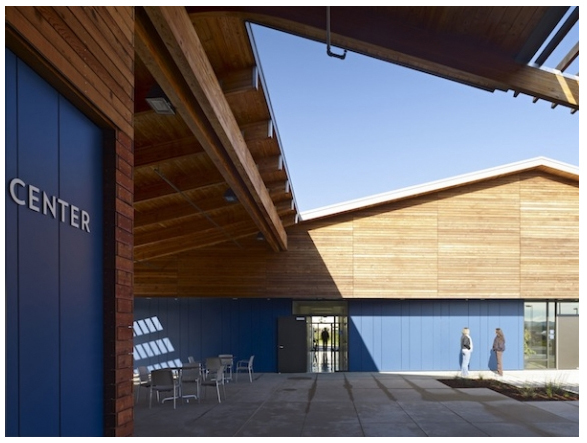 Designed by WRNS Studio out of San Francisco, The Watsonville Area Water Resources Center is a informational, serviceable and visual presentation of the water recycling plant it assists. It combined three different city and county water departments into a work area designed to support collaboration on issues of water management, conservation, and quality in the Pajaro Valley. The building houses administrative offices, a regional command center, and a water quality lab. It didn’t take much for The American Institute of Architects’ Committee on the Environment to name this one of their Top Ten Green Projects. Water is the key ingredient of what makes this building Green friendly, relying mainly on recycled water. It is used to help heat and cool the building and the low-flow plumbing helps consolidate the use. Like with any structure going green, the company also uses high-efficiency lighting, natural ventilation, custom built rain screen and more. This exceptionally designed piece of architecture has caught the eye of everyone who has visited. The beauty of the building was created to blend in with it’s surroundings. Low to the ground with some sides containing close to floor-to-ceiling windows, you can’t help but stare in amazement at it’s structure. Not only is the beauty of The Watsonville Area Water Resources Center something to be in awe of, but what the Center stands behind is also. It supports the Water Recycling Project, a joint effort of the City of Watsonville and the Pajaro Valley Water Management Agency. Together they provide recycled water to farmers throughout the coastal areas of South Santa Cruz and North Monterey counties. Paolo Soleri was born in 1919 in Turin, Italy. He received highest honors from the Politecnico di Torino in 1956 and came to the U.S. in 1947 to spend a year and a half at Taliesin West in Arizona and Taliesin in Wisconsin with Frank Lloyd Wright. Soleri returned to Italy in 1950 where he was commissioned to build Ceramica Artistica Solimene, a large ceramics factory. Here he learned the concepts for his famous Arcosanti bells. He settled in Arizona in 1956 and committed his life to Cosanti Foundation, a non-profit educational foundation teaching his philosophy and works under the influence of Jesuit paleontologist and philosopher Pierre Teilhard de Chardin. 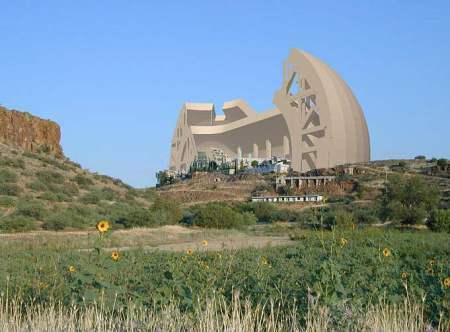 The Foundation’s major project is Arcosanti which I have visited. It is a planned community under construction since 1970 and is 70 miles north of Phoenix, AZ. Based on the concept of Arcology, it marries architecture with ecology. It is a self-sustaining model of communal living. Since 1970 over 6,000 visitors had participated in the construction project, it was only 3% complete as of 2005. The sale of the Arcosanti bells help to keep the Foundation alive, I have two of them and they are beautifully designed. Soleri wind bells are made from either ceramic or bronze. You can watch them being made in the foundry on the premises, the red hot molten metal being cast to make each one by hand. I have had mine for many years; it is a treasure and a reminder of the dream of a man in the desert of Arizona. Solari has received many awards for his work and written several books. He has three honorary doctorates and two fellowships from the Guggenheim in New York, NY. Ieoh Ming Pei was born in Guangzhou, China in 1917 and raised in Hong Kong and Shanghai. Better known as I.M. Pei he moved to the U.S. in 1935. His mentors were Le Corbusier who he met while attending MIT in 1935 and Frank Lloyd Wright. While atending MIT and Harvard he befriended Walter Gropius and Marcel Breuer. As a child he learned English from reading the Bible and Charles Dickens in the Protestant school run by missionaries that he attended. He loved Hollywood and especially Buster Keaton and Charlie Chaplin. Watching Bing Crosby movies inspired him to move to America to attend college. His most controversial building is the glass and steel pyramid he designed for the Louvre museum in Paris in the early 1980’s. He has won many prizes in architecture most notibly the Pritzker Prize sometimes called the Nobel Prize of architecture. Jacqueline Kennedy Onassis chose I.M. Pei to construct the memorial library dedicated to President John F. Kennedy after his assassination in 1963. She felt he was an architect full of promise like Kennedy was, and he was born the same year as the President. Pei considers this commission to be the most important of his life, filled with symbolism for optimism. It was dedicated on October 20, 1979. His body of work is enormous, I. M. Pei still dazzles us with his vision and style. Modernistic with cubist themes he combines traditional elements of architecture with progressive design based on geometric patterns. Julia Morgan is best known as the architect who built the Hearst Castle in San Simeon, California for Randolf William Hearst the newspaper magnate. Julia was born in San Francisco, CA in 1872 and raised in nearby Oakland just across the Bay. She designed over 700 buildings in her career just in California. Throughout her career she built many buildings serving women and girls. Many Bay Area YWCA’s are her design. Graduating from the University of California in Berkeley with a degree in Civil Engineering in 1894, she was urged by her friend and mentor Bernard Maybeck to go to Paris to attend the Ecole des Beaux-Arts. She was denied at first because they did not allow women. Upon her second try she deliberately failed to make a point and the third time she passed the architecture exams and placed 13th out of 376 applicants. She was the first woman to graduate. She returned to Berkeley and worked on projects on campus, providing decorative elements on the Hearst Mining Building and designs for the Hearst Greek Theater. In 1904 she opened her own office. Many commissions followed the 1906 earthquake in San Francisco. 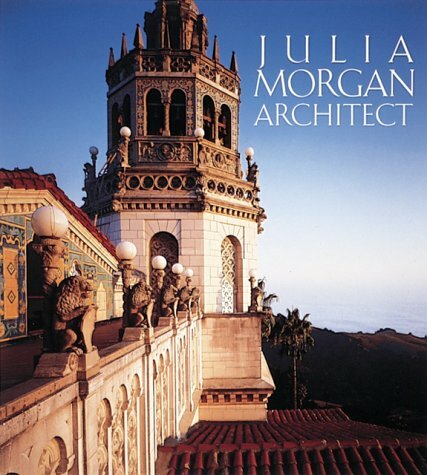 She built many building in the Bay Area, The Julia Morgan School for Girls in Oakland pays homage to her. The school is the only middle school for girls in the East Bay occupying Alderwood Hall at Mills College, a 1924 design by Morgan. She was inducted into the California Hall of Fame by Governor Schwarzenegger and First Lady Maria Shriver on May 28, 2008 located at The California Museum of History, Women and the Arts. Her great-niece accepted the honor. Born in New York City, Bernard Ralph Maybeck was the son of a German immigrant. He studied at the Ecole des Beaux Arts in Paris, France and moved to Berkeley, California in 1892. At the University of California, Berkeley he taught architecture to such famous students as Julia Morgan and William Wurster. He was awarded the Gold Medal of the American Institute of Architects in 1951. Maybeck was a pioneer in the Arts & Crafts movement but was equally comfortable working in the Gothic and Beaux-Arts Classicism styles. In 1910 he designed the First Church of Christ, Scientist which is a National Historic Landmark and considered one of his finest works. It is a mixture of Medieval Europe, Celtic, Japanese, Nordic and shingle style architecture – the effect is pure magic. 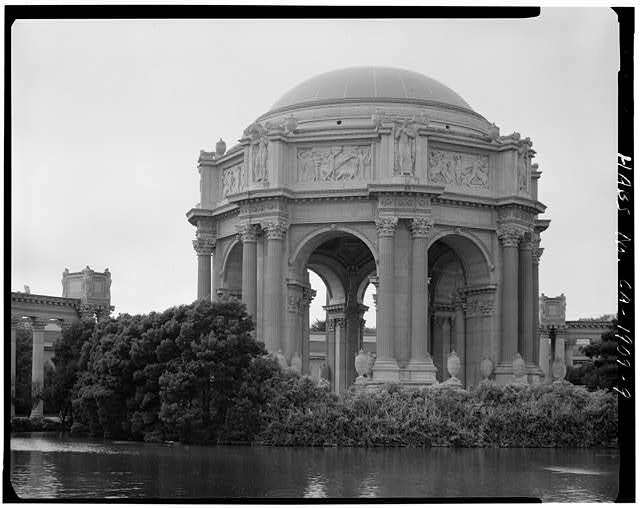 Maybeck designed the famous landmark The Palace of Fine Arts in San Francisco, CA as part of the 1915 Panama-Pacific International Exposition. This structure embodies how Roman architecture could fit within a Calfornia context. 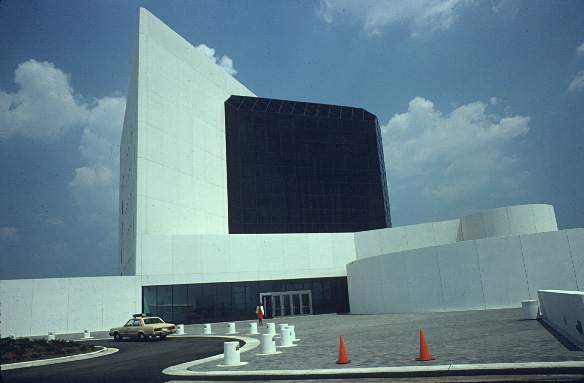 In this design he took advantage of negative space with the absence of a connecting roof to the rotunda and art gallery, there are no windows in the gallery and it is set against a backdrop of the bay and the local flora. His homes and buildings can be seen dotting his beloved city of Berkeley and all around the BayArea, he is one of the most beloved architects of our time in this part of the world. It is because of his whimsical design that I grew to love and appreciate the architecture of the San Francisco Bay Area.